There is something about putting something in the slow cooker on a Friday morning that is oddly rewarding. It's like you already finished cooking meals for the week and you haven't even gone to work yet. The drawback, however, is if your husband has needed to stay after work for the past few Fridays and you make these terrific, sweet-tangy, melt-in-your-mouth tender pork sliders and you are left eating them with your 17 month old, trying to pry some "Mmmmms" out of her so you aren't the only going gaga over this dinner. The homemade barbecue sauce, slow cooked with the tender pork, topped with a tangy coleslaw and sandwiched in a slider bun made for one of the best sandwiches I've ever made from the slow cooker. I almost made a sandwich and drove it to my husband's work just to get a high five on its deliciousness. Knowing the company had already ordered in pizza (and more truthfully, not wanting to be known as the crazy sandwich lady to my husband's coworkers) was what held me back. Still, I think if I salesperson had knocked on our door I would have made him come in and eat a slider or two just for the compliments. If you make this (and I think you should) here are couple things to know going in. First of all, the morning prep work is minimal, which is just how I like my slow cooker meals to be. There is no way I'm going to chop multiple items at 6 AM. Not happening. Be warned though, that there is some prep work required at the end of the pork cooking time, namely making the barbecue sauce, reducing it down, and cooking the pork in it for an hour in the slow cooker. This is important to know because you'll need to plan ahead, and these steps can't be rushed. The barbecue sauce isn't difficult, but contains a hefty cup of balsamic vinegar. I like to taste things as I go while cooking and I almost threw away the sauce before I simmered it because it was so sour and vinegary. Luckily I pressed on and cooked it according to the recipe directions and once it had cooked down it had tamed down, and after an hour of cooking with the pork in the slow cooker it was perfectly tangy but not overly so. Also, the recipe calls for adding some deli coleslaw on each sandwich. I'm not crazy about coleslaw. I was intrigued about the combination, though, so I bought a little container of it to try. I'm telling you, the combination works. The sweet-tangy pork with the sweet-sour coleslaw is excellent. It reminded me slightly of the kick you get from the sauerkraut on a reuben sandwich. The pork is delicious on its own, but something special with the coleslaw on top. I vote that you give it a try if you are feeling adventurous. Trim as much fat from the pork shoulder as you can and add it to the slow cooker. Add onion and sweet pepper, then sprinkle in thyme and rosemary. Pour broth over meat, cover the slow cooker and cook on low heat for 9-10 hours or 4 1/2 to 5 hours on the high heat setting. When meat has finished cooking, transfer to a cutting board and use two forks to pull it apart into shreds, discarding fatty pieces. Strain out vegetable pieces from the slow cooker and discard remaining cooking liquid. Return shredded meat and vegetables to the slow cooker and stir in the thickened barbecue sauce. Cover and cook 1 hour on low. 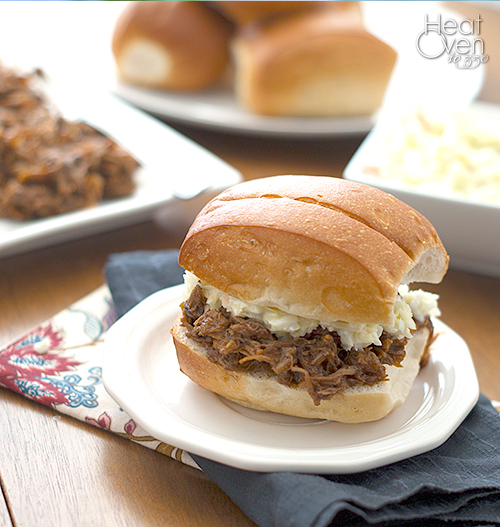 To serve, top a split bun with a spoonful of meat and a dollop of coleslaw. Oh my this sounds so delicious! 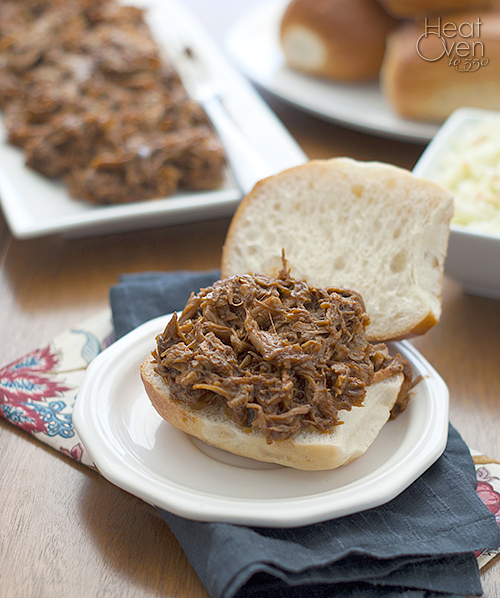 I love pulled pork, and love balsamic. I just got a new bottle of one I love, so I will pick up some pork this weekend and try this! Thank you!!! mmm, this looks great, Nicole! Can't wait to start using my slow cooker...so many yummy recipes to try!! Pulled pork is one of our go-to winter meals, and I have to confess I often just grab a jar of barbecue sauce from the store to make it super easy. That said, I am most definitely trying this instead next time. With all of that balsamic vinegar in the mix there's no way this isn't the best thing ever!! This looks fantastic. I cannot wait to make this recipe.